This is our most popular and most highly recommended tour. If you have the time we strongly recommend that you book in for this tour. This tour operates from 9:30am - 1pm Monday to Saturday. Sunday tours are available by request. 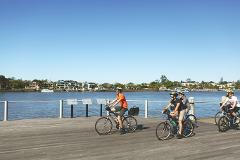 This tour is conducted solely on bicycle paths and iat a gentle pace suitable for everyone. There are many scheduled stops to learn some fun facts about Brisbane and take some fantastic and fun photos of the city. Time: 2:00-4:00pm. 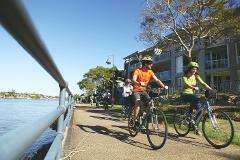 Join your friendly local guide as we take a beautiful and leisurely ride around the Brisbane River to experience Brisbane's best night markets followed by a river cruise back to Southbank Parklands. Operating in summer months only, this tour is the same as the Essential Brisbane tour but is held in the evening as the sun sets over Brisbane. 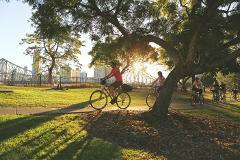 It is a beautiful time of day for a bike ride as the heat of the summer day disappears.